This is a nice itinerary to combine enjoyment of the great Istrian towns with a little relaxing on the beach, especially if you're flying into Pula airport. Istria is stuffed with great historical treasures and cultural attractions while the Kvarner is known for its fantastic sandy beaches and tranquil islands. 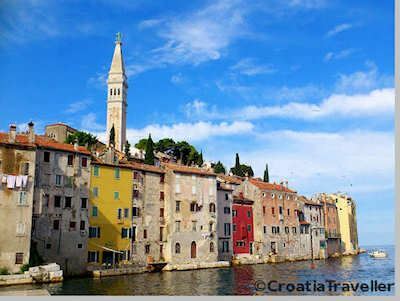 Rovinj is a must and between Pula and Opatija lies the hilltop town of Labin where you can amble through a former coal mine or admire exquisite Venetian architecture. Offshore is the rugged island of Cres, home to the gargantuan griffon vulture and further south are the pine forests of Losinj. This itinerary is enjoyable from late spring through early fall. Even at the height of the summer season the resorts are less crowded than in southern Dalmatia. To do this in two weeks, you'd need to rent a car since bus transport on Cres, Losinj and Krk is tricky. Would you like a custom itinerary? I can design itinerary just for you, your interests, allotted time and budget. See more. Start by visiting the Roman amphitheatre and other antiquities from Pula's day as a provincial capital in the Roman empire. Visit the Brijuni Islands National Park where Tito entertained his celebrity guests. Drive to Rovinj. Along the way, stop in Vodnjan to see the mummies or visit the hilltop village of Bale. Visit the town of Rovinj, climbing the old streets to admire the Cathedral of St Euphemia. See more on Rovinj sights. Take a short boat ride to Crveni Otok or rent a bike and pedal around Zlatni Rt, stopping for a swim. Or perhaps make a day trip to Pazin or Buzet? See more on day trips from Rovinj. Drive to Porec, stopping to visit the Lim Fjord on the way. Visit the Euphrasian Basilica and take a day trip to Motovun. Drive to Brestova which has a regular car ferry that runs to Porozina on Cres Island (www.jadrolinija.hr) and then visit Cres Town before driving south on Losinj Island to Mali Losinj. Relax on Cikat beach and visit Veli Losinj. Explore historic Krk town, then return to Valbiska for the ferry to Lopar on Rab Island (www.jadrolinija.hr). 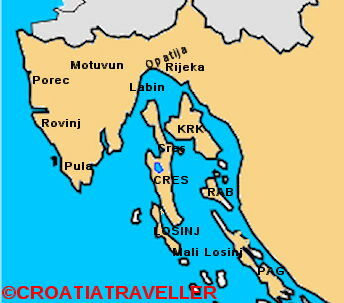 Bask on Lopar's famous "Paradise Beach" and visit historic Rab town. 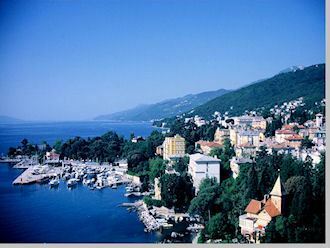 Take the car ferry from Misnjak to Stinica (www.rapska-plovidba.hr) and head to the elegant sea resort of Opatija. heading back to Pula. Drive back to Pula for your return flight. Stop at Labin for a truffle omelette along the way!